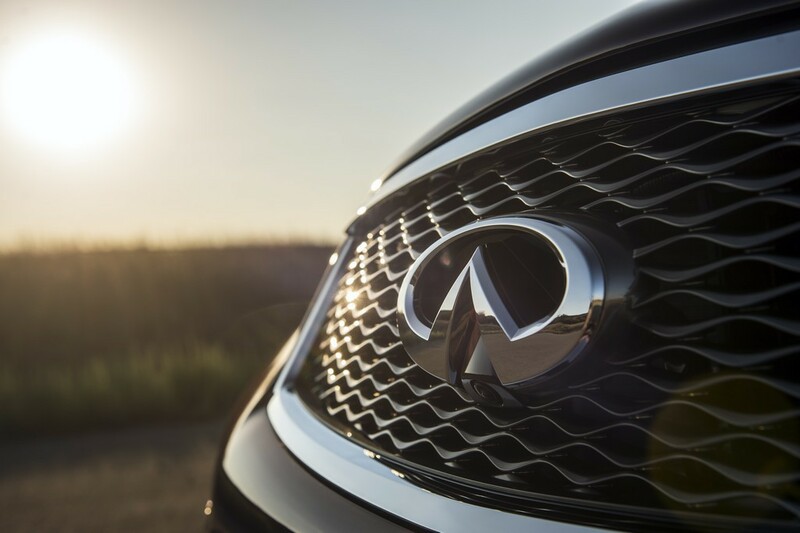 In a year when crossover utility vehicles (CUVs) have become the best-selling vehicles in the North American market, Infiniti has something to marvel about. The smallest CUV they sell (at least until the new QX30 makes it to market as a 2017 model), the QX50 has been a hot selling model for the marque. Through the end of March, QX50 sales had improved by an astounding 570%, and helped Infiniti reach new sales records for the month. This from a vehicle that, on first glance, seems to be much the same as when it was first introduced in 2008 as the Infiniti EX35. Beyond name changes, sales incentives, lease packages and other maneuvers, what could explain this new-found popularity of the QX50? To find out, I drove hundreds of miles and spent an extended period with a 2016 QX50 RWD Touring package. The first thing to note was the beautiful finish and build quality of this Oppama-produced Infiniti. 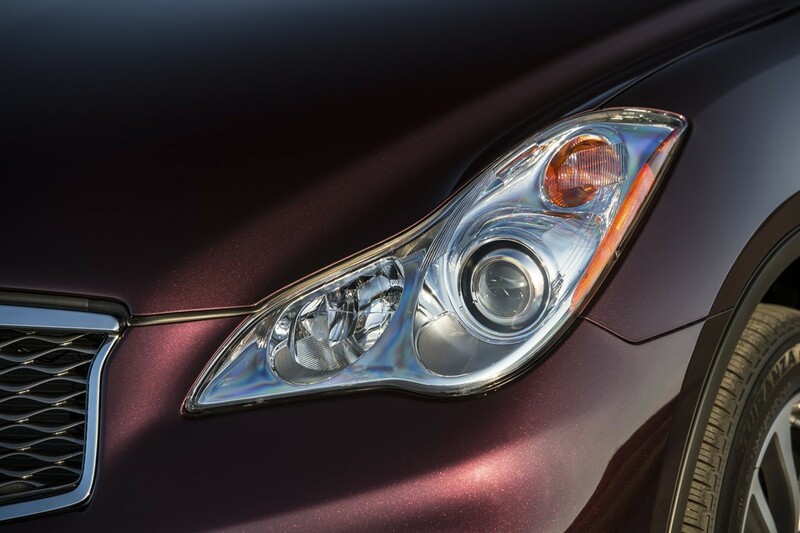 The “Midnight Garnet” color is one example of a metallic paint that changes hue depending on the angle and intensity of sunlight, but isn’t finicky (or too expensive) to apply at the factory. Combined with new LED running lights, LED fog lights, side sills, rear fascia and turning lights integrated into the mirrors, the QX50 has a familiar, yet updated, profile. Visually, its creased-edge, hatchback styling has weathered the years well and the QX50 still shows well. One quality that’s difficult to discern is a slightly stretched wheelbase, with 3.2” added to all QX50 models. This also affects the curving roofline slightly, as the hatchback profile is not as pronounced. Rear seat passengers will feel a big difference with this change, as the increase in rear legroom and headroom improves comfort markedly. Infiniti has broadened the appeal of the QX50 beyond carrying just two front seat passengers, and the model is now “right-sized” to carry four people in comfort. 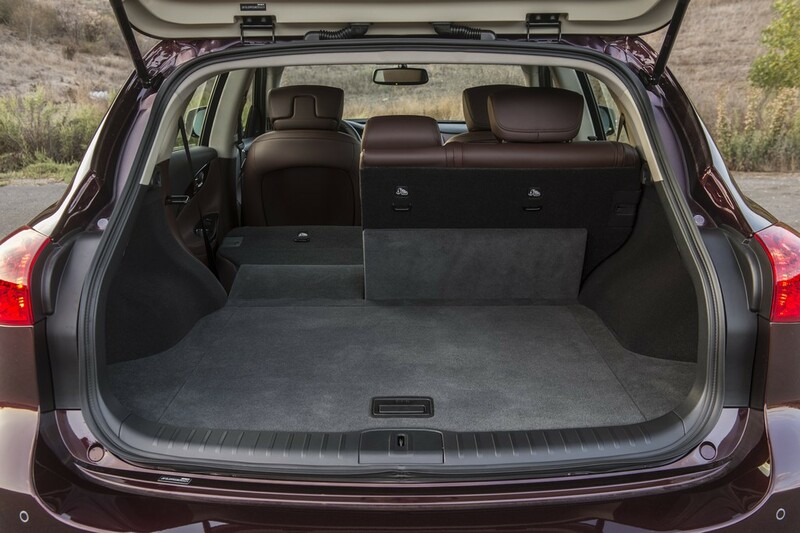 Beyond increasing the cargo capacity slightly, the longer wheelbase also could be felt while driving the QX50. At highway speeds, the ride is markedly better than the older EX35 models I’d driven earlier. Infiniti has obviously retuned dampers and spring rates to match the longer Front Midship (FM) chassis. Handling performance is also improved, as the longer wheelbase adds stability during high-speed maneuvering and negotiating off ramps. 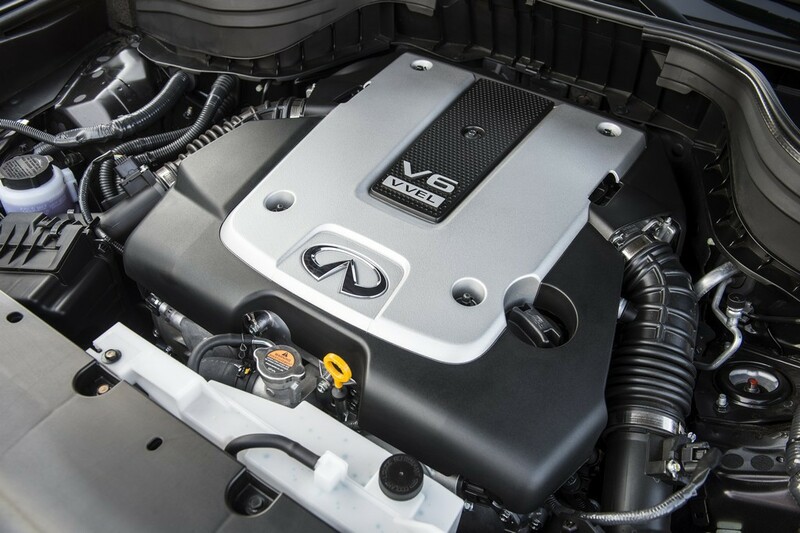 What wasn’t hard to get used to was the proven and powerful VQ37VHR that is now standard equipment in all QX50s. Making 325 HP at 7,000 RPM and 267 lb/ft TQ at 5,200 RPM, the powerband is broad and meaty. Even though it drives through a seven speed auto, this is a relaxed powertrain that doesn’t even need to shift down unless you really plant your right foot. And while the QX50 is no lightweight at 3,855 pounds, the VQ37VHR hauls this load quite easily. One downside is the requirement for premium unleaded and plenty of it; EPA figures are 17 city/24 highway (20 MPG combined). Between the torquey V6 and the longer wheelbase, the QX50 feels like a different vehicle from any of the EX35/37s I’d sampled previously. More stable at speed, with plenty of reserves in both power and handling on both dry and wet pavement. Four channel ABS brakes were equally strong, with meaty 12.6 X 1.3” vented discs up front and 12.1 X 0.6 units out back, although they were slightly overboosted. 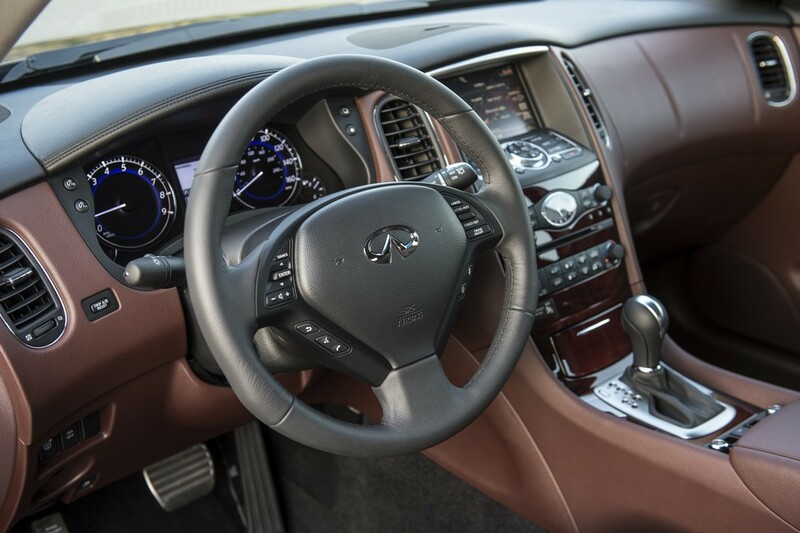 The old adage of “don’t fix what’s not broken” could certainly be applied to the sumptuous QX50 cabin. A chestnut leather interior added a nice contrast to the black IP, with polished walnut or piano black facings adding a touch of elegance. Beyond that, the central instrument pod houses a tach on the left, speedo on the right and multifunction gauge in the middle. These gauges use white and blue markings on a black background to convey information at a glance. And while the 7.0” full color center screen has limited touch screen capabilities, the display remains effective in conveying accurate navigation data. There’s also a Bluetooth hands-free phone system, RearView monitor and USB connection, which uses the 11-speaker BOSE sound system as part of the $500 Premium package. My only criticism is a lack of local attraction information on the nav system; a feature which used to be accessible through Infiniti navigation. One addition I played with throughout this journey was the Intelligent Cruise Control (ICC), included in the optional $2,750 Technology package. Using sonar sensors built into the front bumper, this system continuously monitors traffic ahead once a set speed was entered. On the highway, this proved to be a bit of a hindrance as the system would drop throttle and actively brake if slower traffic moved abruptly into my lane. It would have been a smoother transition to simply reduce throttle and use aero and tire drag to slow the QX50, but the system is set to maintain a preset following distance and can’t be over-ridden unless ICC is cancelled. Could this be a possible preview to a troublesome future with autonomous vehicles? Unclear, but ICC is one driver assistance option I wouldn’t mind deleting from any future purchases. 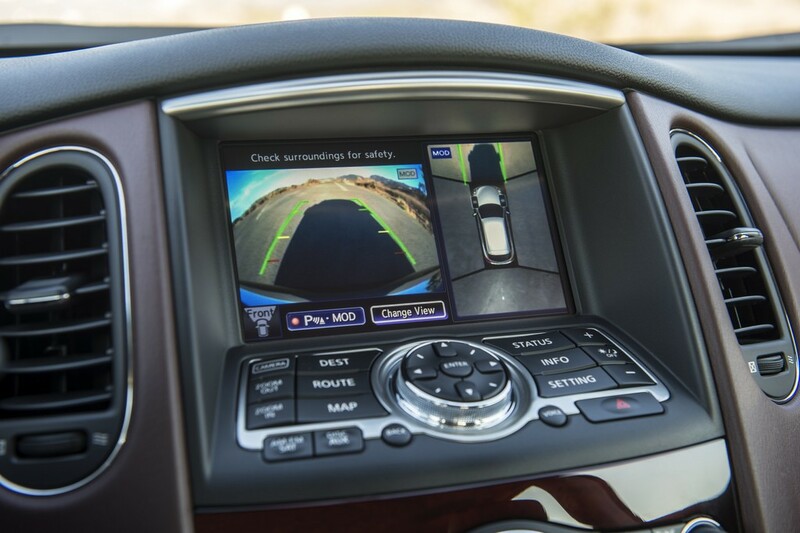 More useful technology came in the form of the Blind Spot Warning feature, which uses cameras to let the driver know when another car was alongside and activates a light on the side mirror. If any of this sounds like skepticism towards modern technology designed to augment driver skill and awareness, then color this racecar driver-turned-automotive journalist a freethinker. 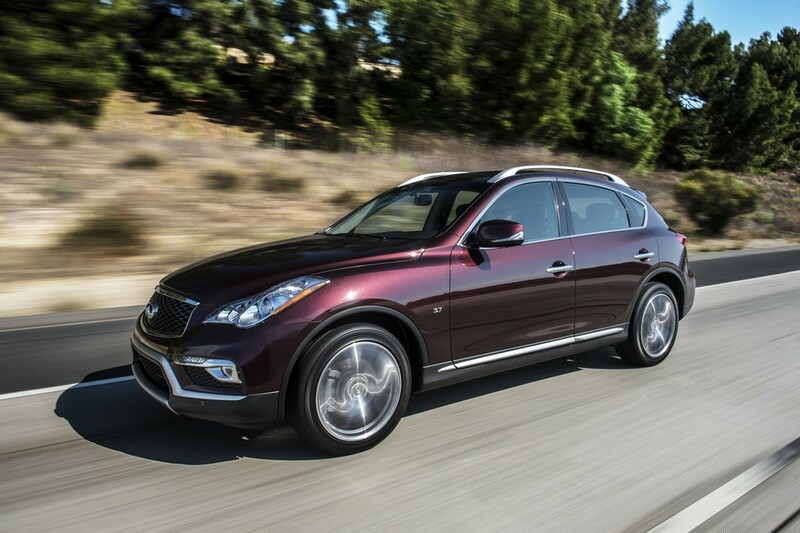 It could also be a reason why the QX50 impressed in so many ways. Infiniti spent most of its mid-model update budget improving particular aspects of the CUV, but technology wasn’t the focus. Stretching the wheelbase, adding interior room where it was badly needed, and improving the driving dynamics are all tangible benefits in my view. 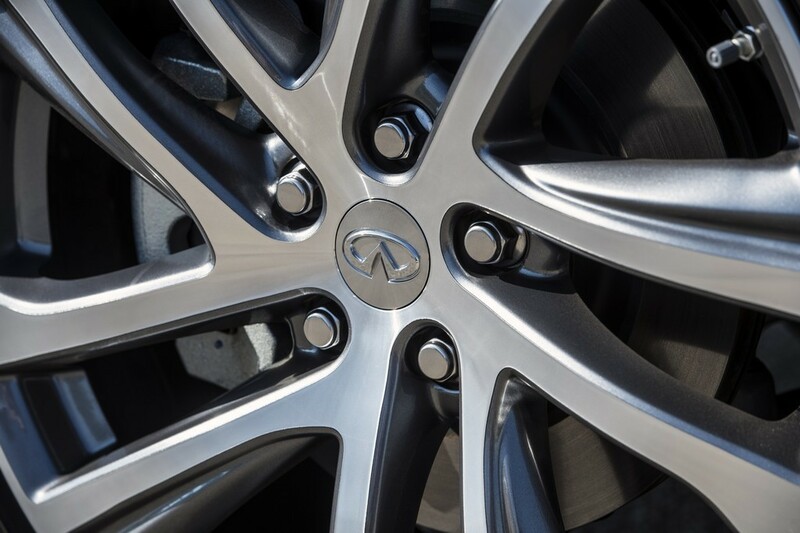 Infiniti chose to retain most of the exterior styling, interior ergonomics and design–all first rate nine years ago—as they still hold up well in today’s marketplace. And while this QX50 came loaded with five optional equipment packages, raising its MSRP to $43,535, deleting a few options (like the pricey technology package) wouldn’t hurt one bit. My suspicion is many Infiniti dealers recognize the QX50 sells quite well in the entry level luxury CUV market and are only too happy to sell as many as they can get. 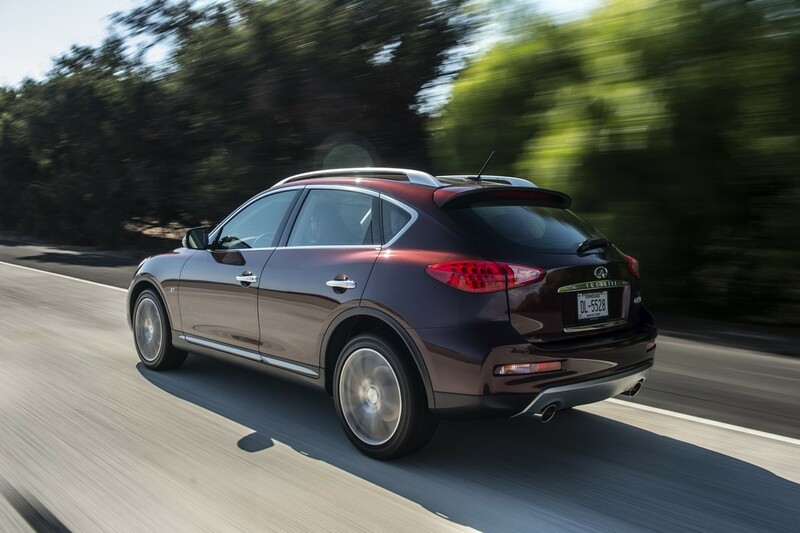 For a vehicle as stylish, well-built and satisfying to drive as the QX50, that’s something else to marvel at.